Racial discrimination in the workplace means treating a job applicant or employee unfavorably because of that person’s race or because of characteristics associated with that race. Racial discrimination can also include treating someone unfavorably because they are married to, or associated with, a person of a certain race. Racial discrimination is a serious offense. Federal, New York state, and New York City laws protect employees from race discrimination, including workplace harassment because of race. Racial discrimination lawyers can help employees who experience racial discrimination in the workplace. Contact New York racial discrimination attorney Charles Joseph for a free consultation to protect your rights today. Charles Joseph has over twenty years of experience with workplace discrimination cases. His firm has recovered more than $120 million for clients. Reach out today for a free, confidential consultation. It is illegal for an employer to make employment decisions based on your race. Employers cannot make employment decisions based on your race instead of your skills or how well you do your job. This includes decisions about hiring, firing, discipline, distribution of benefits, promotion, compensation, job training, or any other condition of employment. If you believe that you have been the victim of race discrimination, you are protected under federal, state, and New York City racial discrimination laws. Making employment decisions––including hiring and firing––based on race or race stereotypes violates the law. This also includes unfavorable employment decisions because someone is associated with a person of a certain race. You apply for a job for which you have experience and excellent qualifications, but you are not hired because some of the company’s long-time clients are not comfortable dealing with African Americans. You are told that you are being laid off due to company cutbacks and reorganization, while white employees with the same job and less seniority keep their jobs. Racial discrimination laws also protect employees from not receiving promotions, including tenure, because of race or race stereotypes. You have worked as a low-level manager at a company for years and have had excellent performance reviews. Your responsibilities have increased over time, but your job classification and salary do not reflect this. Meanwhile, white colleagues have been promoted to mid and upper level management to reflect their increased responsibilities. You have worked for your company for several years, receiving exemplary reviews and an employee-of-the-year award, yet every time you apply for a promotion, the position is filled by a less qualified person of a different race. The law protects you from race-based differences in any form of compensation, including salary, overtime pay, bonuses, stock options, profit sharing, life insurance, and vacation or holiday pay. You worked your way up to the position of regional manager. A regional manager of a different race with similar training and work experience was recently hired, and you learn that he will be paid more than you. You are a top salesperson for your company, but your employer reassigns you to a less desirable territory because it is a minority neighborhood, while a white employee with lower sales is given your territory and client base, enabling him or her to make much more in commissions than you. The law prohibits assigning primarily minorities to predominantly minority establishments or geographic areas. Employers cannot treat you unfavorably because of personal characteristics or stereotypes associated with race. The law prohibits employment decisions based on stereotypes and assumptions about the abilities and traits of individuals from certain racial groups. Employers cannot treat you unfavorably because of personal characteristics associated with race, including hair texture, skin color, or facial features. Protected practices or characteristics can also include cultural dress, manner, or speech, as long as the practice or characteristic does not materially interfere with the ability to perform job duties. For example, your employer cannot refuse to promote you solely because you wear your hair in braids or dreadlocks. Employers cannot excuse racially motivated decisions on the anticipated reactions of other employees or customers. Employers cannot make racially motivated employment decisions with the excuse that the decision was driven by business concerns such as the effect on employee relations or the negative reaction of clients or customers. If your employer physically isolates a particular group of employees away from other employees or customers because of race, that conduct could constitute race discrimination. It is illegal to exclude minorities from certain positions or group, or to categorize employees or jobs so that certain jobs are generally held by minorities. Unintentional racial discrimination in the workplace can also be illegal. Job policies that appear neutral can be discriminatory if they disproportionately harm workers of certain races, as long as the policy is not job related. An apparently neutral policy that requires all employees to have a high school degree may disproportionately exclude African Americans and Latinos, who have lower high school graduation rates. If a high school degree is not necessary to perform that particular job––such as a position that primarily involves physical labor––the policy could be discriminatory. A “no-beard” employment policy that applies to all workers without regard to race may not appear discriminatory, but it could be unlawful if the policy is not job related and has a negative impact on the employment of African American men who have a predisposition to a skin condition that causes severe shaving bumps. However, Section 1981 only prohibits intentional discrimination by your employer, and would not cover these situations. Even though race and color overlap, they are not synonymous. Color discrimination occurs when a person is discriminated against based on the lightness, darkness, or other color characteristic of their skin. The law prohibits color discrimination against all persons, including caucasians. You do not have to be a member of a protected race to be the victim of race discrimination. It is against the law to discriminate against someone because he or she is associated with someone of a different race. Your marriage to, or association with, someone of a different race. Your attendance or participation in schools, places of worship, or other cultural practices generally associated with certain minority groups. Racial discrimination can occur when the victim and the person who inflicted the discrimination are the same race or color. Race or color can never be a bona fide occupational qualification. You can be the victim of racial discrimination in the workplace even when no employment decision is involved if race-based harassment has created a hostile work environment. Words, such as jokes, racial slurs, or offensive or derogatory remarks about someone’s race or color. The display of images such as racist symbols like swastikas, confederate flags, nooses, or racist cartoons or drawings. Your employer may be responsible regardless of whether the offensive images are posted in a public area, displayed in a person’s office, or distributed via email. Under federal and state law, if comments or acts are not offensive in the extreme, they constitute harassment only if they occur often enough to create an intimidating, hostile, or offensive work environment. However, a single incident such as a physical assault, use of “the N word,” or hanging a noose, might be so threatening and insulting that it could rise to the level of harassment. It is a misconception that only the target of hostile comments can be the victim of a hostile work environment. You can be a victim even if you are not the person being targeted by the offensive behavior – and even if you are not a member of the targeted race. It is a misconception that only your boss can create a hostile work environment. Employers have a responsibility to prevent race discrimination. If you complain about race discrimination, it is illegal for your employer to take any action against you. If you choose to file a claim for race discrimination, you have several options. You can file a complaint with the U.S. Equal Employment Opportunity Commission (EEOC), which handles violations of federal law. The New York State Division of Human Rights handles NYSHRL violations, and the New York City Commission on Human Rights is responsible for CHRL violations. If your claim falls under multiple racial discrimination laws, the three agencies have what is called a “work-sharing agreement,” which means they cooperate with each other to process your claims. There is no need to file a claim with each agency. You simply need to indicate that you want your claim “cross-filed” with the other agencies. Learn how to file a discrimination claim, how to file an EEOC complaint, or contact a New York racial discrimination attorney for help. Applies to companies with more than 15 employees, including employment agencies, unions, and federal, state, and local governments, but not independent contractors or domestic workers. Applies to companies with more than 4 employees, including state and local governments and domestic workers. Applies to companies with more than 4 employees, including municipal employers and unpaid interns, as well as independent contractors under certain conditions. Applies to all employers regardless of size, including federal, state, and local government employers. You have 3 years from the date of the incident to file your claim in state court. You would file this claim directly in a federal court. You can file a claim up to 4 years after the violation. Reprimands and negative performance evaluations only covered if accompanied by a reduction in pay or demotion. Reprimands and negative performance evaluations only covered if accompanied by a reduction in pay or demotion. Performance evaluations and discipline decisions are covered by the law, even without reduction in pay or demotion. Reprimands and negative performance evaluations only covered if accompanied by a reduction in pay or demotion. Racial discrimination attorneys can file suit under federal, New York state, and New York City racial discrimination laws. Contact racial discrimination attorney Charles Joseph for a free consultation. 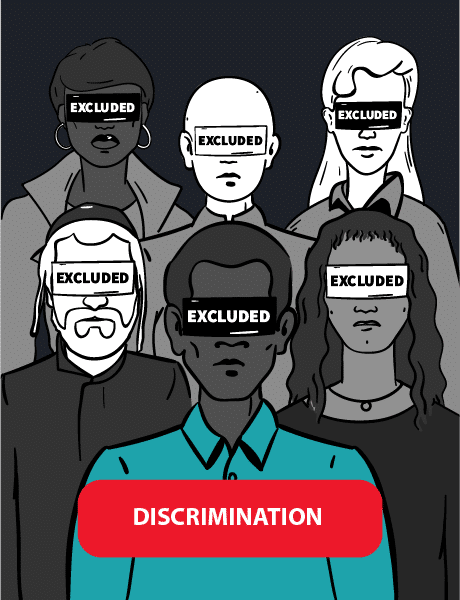 Racial discrimination laws provide financial remedies for employees who faced workplace discrimination. This includes damages, back pay, and other financial settlements. A New York racial discrimination attorney can help file your claim. Back Pay: Back pay compensates victims of race discrimination for the wages, bonuses, and benefits lost due to discrimination. Reinstatement: The court can order your employer to rehire you or to give you a promotion if you were wrongly terminated or denied promotion for discriminatory reasons. Front Pay: Front pay is a monetary amount calculated by the court to help the victim of discrimination return to the level of pay he or she earned before the discrimination. It includes lost wages and benefits. Compensatory Damages: Compensatory damages cover the victim’s out-of-pocket expenses, like therapy, lost wages, and the cost of finding a new job. It also includes emotionalawyl pain and suffering. Punitive Damages: Punitive damages punish the employer. New York City provides broad punitive damages provisions if the employer was negligent, reckless, or consciously disregarded your rights. Attorneys’ Fees and Costs: If the court finds that discrimination occurred, your employer may be required to pay all of your attorney fees and court costs. Racial discrimination laws protect employees, and racial discrimination lawyers can help determine your potential damages. Charles Joseph has over twenty years of experience as a racial discrimination attorney. Call Charles Joseph today for a free, confidential consultation.